To say that Albania is off the tourist path is just a small understatement. And although it may be a challenging cycling destination, the rewards are great. It’s only a matter of time before more people start discovering this gem of a country. Before crossing the border from Greece into Albania, a passing motorist rolled down his window, asked where we were headed, and smiled. “You will see nature” was all he said before waving and driving off. Very prophetic. We crossed into Albania inland via the Permet valley. 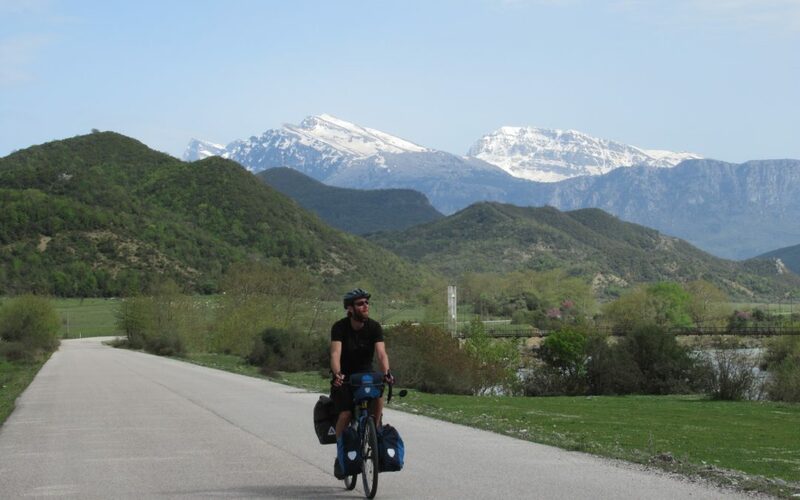 Snow capped peaks met brilliant blue skies as we cycled on deteriorating roads to the scenic town of Permet. It was our first taste of what to expect, both in road conditions and scenery. Unsure of where to head next, we spent a rest day in Permet, enjoying the nearby natural hot springs and eating at two of the four restaurants in town. But what Permet lacked in quantity it made up for in quality; the local fare was hearty, meaty, delicious and very affordable. Keen to get to Berat, a World Heritage Site about 100km to the north, we chose what looked to be a fairly direct and main route according to Google Maps. We asked locals at the junction if we were on the right route. “Berat?” we asked, only to receive discouraging finger wagging and animated conversation in a language we couldn’t understand. We pressed on despite knowing it would be tough going. The paved road soon gave way to a gravelly route with the odd crumbling asphalt reminder of its past condition. We saw four trucks over the next 65km of some of the hilliest and most challenging riding I’ve ever done. The scenery was fantastic and we had it all to ourselves. After eight hours of slogging, we made it to Berat as the sun went down. 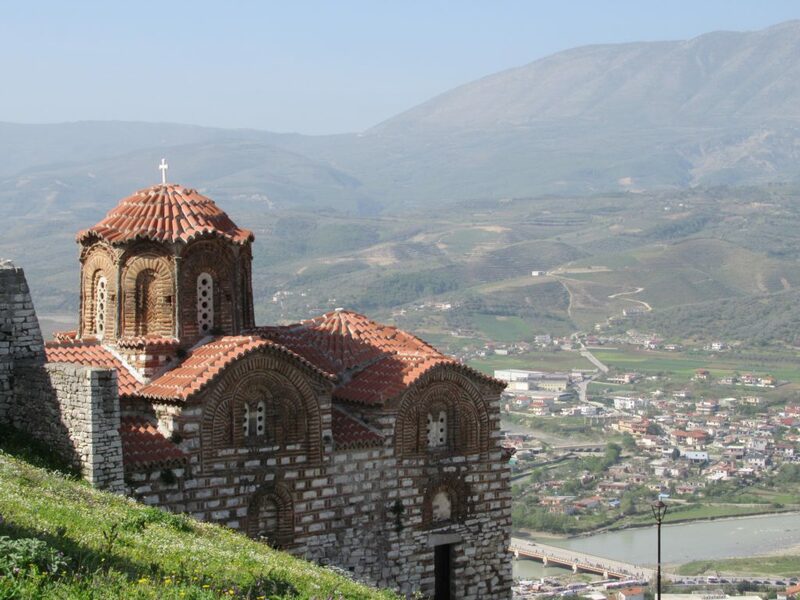 Known as the “City of a Thousand Windows”, Berat is set in the valley bottom of an impressive mountain range. Entrance to its imposing castle was 100 Leke (about $1.10 Canadian), a far cry from the Parthenon of Athens and City Walls of Dubrovnik. 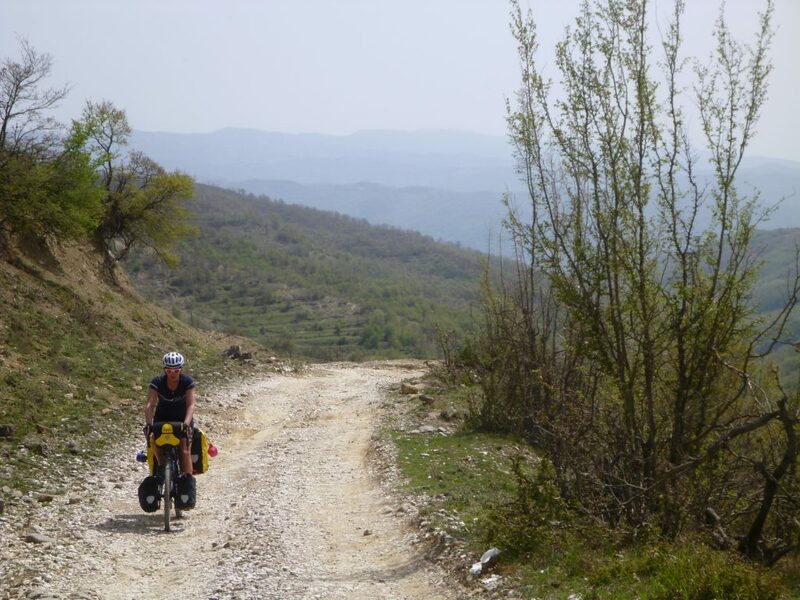 We left the following morning, taking quiet roads from Berat to Elbasan, where we hoped to pick up a more major road to take us east. Unfortunately, with paved roads come traffic and no shoulders. We gave up an hour in after 6km of terrifying and soul crushing cycling against a fierce headwind. A stroke of good luck provided us with a safer alternative, and we arrived on the southern end of Lake Ohrid to continue our voyage north to Macedonia. Halfway through Albania, we had indeed seen a lot of nature. And very few tourists. It was exactly the adventure destination we had hoped it would be, with plenty more still to come.